This class is geared to facilitate those who have never painted and those who have advanced their skills. Most class sessions will include a demo and then time to work on the elements of the demo. Information on materials, including colors and “gimmicks”,and tools is given throughout the six-week period. The goal of this class is to encourage the joy of painting, while improving skills and knowledge.This is a “fun” class, so bring a sense of humor and whatever materials you have and enjoy. 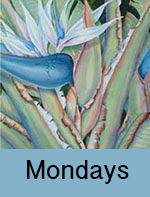 Instructor: Linda Lord is a self-trained artist and illustrator with over 16 years teaching experience in her studio and via the SC Watercolor Society; an Open Studio artist whose exhibits include Cozumel, Mexico. Linda also publishes with a decorative art publisher.